Our professional team is highly experienced in geophysical project operational delivery, technical support and quality control, and have significant project management capability with the ability to plan, design, monitor and execute projects of any size and complexity. Synterra’s field and project management teams are capable of servicing both hemispheres, with extensive experience available from design, planning and execution of numerous 2D, 3D and 4D exploration and development projects undertaken across every major petroleum basin, as well as a range of deep crustal and mineral seismic and gravity surveys. Synterra’s Project Management methodology is based upon the Project Management Institutes (PMI) global standards, tailored to Middle Eastern geophysical surveys. These widely accepted standards will be consistently applied by our experienced team to help you and your organization successfully achieve your project objectives. Our dedicated seismic project management system has been created specifically for seismic projects to ensure the appropriate framework of guidelines, procedures and controls are in place when planning and executing seismic surveys. 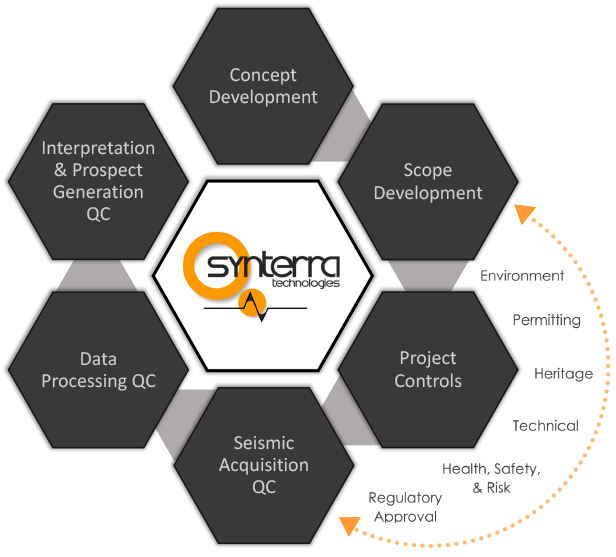 Further details of Synterra’s seismic project management system, statement of capability, insurance and certifications are available upon request. Click here to request your copy of our project management package.